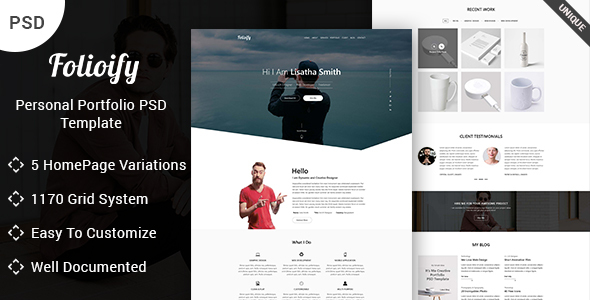 Folioify is a high quality premium Portfolio and user experience PSD Template that is clean and professional UI with neutral colour scheme and 5 PSD files.In this PSD, All layers are perfectly named and grouped for easy customization.This PSD Template is suitable for portfolio websites. You will able to conver it into HTML, Wordpress, Joomla, Moto and other platforms easily. All images are used for preview purpose only that is NOT included in the final purchase files. If you have any problems, contact with us via Email:support@devstheme.com or comment. We are always here to help you. If you need to special customization, contact with us via Email: support@devstheme.com or comment. We are always here to help you. Once again thank you for purchasing our Portfolio PSD Template.